A Little Rock beekeeper captured a swarm and hived it in his Kenyan Top Bar Hive. Ten days later he checked on the bees and found the sizeable colony building combs and filling them with pollen and honey. The bees were gentle and their behavior was normal. Carefully inspecting the combs, the beekeeper found no eggs or larvae, however, he located a small queen in the hive. It is likely that the beekeeper captured a secondary or “after swarm,” a swarm emitted after a primary swarm. Beekeepers across the Mid-South have seen many primary and secondary swarms this year. 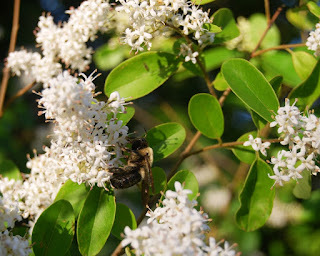 The above normal number of swarms may largely result from this spring’s wet weather that encouraged profuse blooming of plants like the invasive privet shown being visited by a carpenter bee in today’s photo. Privet nectar fills brood nest cells needed for egg laying; this congestion leads to swarming. As a honey bee colony prepares to swarm, it typically produces a number of queen cells. Then, when the colony divides and swarms, the old queen leaves with roughly half of the bees. The original hive is usually left with a sealed queen cell for a queen to emerge, mate, and remain in the hive. If the hive emits one or more secondary swarms, they will contain virgin queens. All virgin queens need five or six days to mature after emerging as adults before their mating flights and another five or six days of further ovary development afterward before they begin laying eggs. A secondary swarm’s virgin queen will not be able to lay eggs as quickly as a primary swarm’s queen. After a secondary swarm moves into its new hive, its virgin queen must make mating flights before she can begin laying eggs. Thus, there will be a couple of weeks delay before egg laying begins in the new hive. Throughout this time the virgin queen emits pheromones that organize the colony in a similar fashion to mature, mated queens.